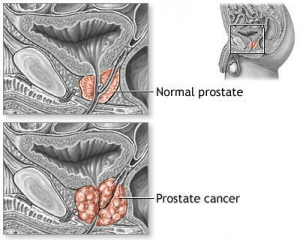 Prostate cancer is one of the major causes of cancer deaths, and efforts at prevention and treatment have not been completely successful. Fortunately, alternative approaches to prostate cancer continue to be researched. Resveratrol, the famed antioxidant associated with berries and red wine, has gradually been supplanted by pterostilbene as an option for blocking prostate cancer growth at its earliest stages. These two antioxidants share similarities, but pterostilbene so far appears to offer stronger and more comprehensive effects in this area. How Does Pterostilbene Compare to Resveratrol for Treating Prostate Cancer? 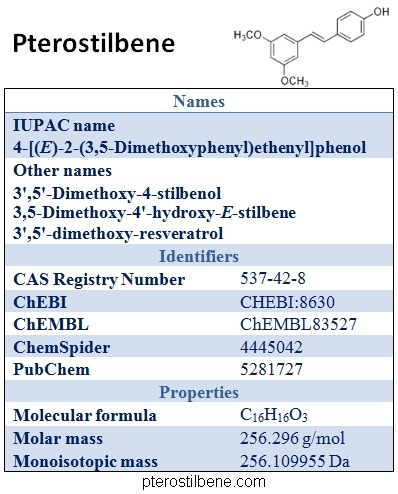 Pterostilbene is actually of the same family of resveratrol (they are stilbenes), but the molecule has two methoxy groups instead of hydroxy groups for resveratrol. While more stable and increased absorption is one advantage that pterostilbene holds over resveratrol, it is not the only one. In fact, pterostilbene seems to be more effective than resveratrol in a number of ways. Importantly to prostate cancer prevention and treatment, pterostilbene downregulates MTA1, a protein involved in prostate cancer metastasis, more potently than does resveratrol (1). By contrast, resveratrol is poorly bioavailable and is metabolized too quickly to have a major impact on MTA1. These problems were disappointing after researchers first discovered the ability of resveratrol to fight prostate tumors, but pterostilbene has since restored interest in this family of stilbene compounds for prostate cancer treatment. How Can Pterostilbene Fight Prostate Cancer? In addition to blocking the action of MTA1, pterostilbene inhibits the growth, progression and metastasis of prostate tumors. The significance of pterostilbene’s effects on MTA1 involves deregulation of the PTEN/AKT pathway, which has been linked to MTA1. The AKT signaling pathway is well known for its tumor-promoting effects whereas PTEN normally antagonizes that pathway. When PTEN is reduced, as it has been found to often be in advanced-stage cancers in the prostate and elsewhere, the AKT pathway is better able to increase tumor progression. Inhibiting MTA1 prevents the reduction in PTEN, keeping the PTEN/AKT pathway intact and blocking cancer growth as a result. High levels of MTA1 in the prostate drive inflammation, tumor growth and production of new blood vessels that feed tumors. At the same time, increased MTA1 prevents the destruction of cancerous cells. After linking MTA1 to PTEN at different levels and finding that MTA1 binds to PTEN promoters, researchers determined that MTA1 inhibition could be an effective means of preventing and treating cancer of the prostate. Pterostilbene, with its advantages over resveratrol in terms of absorption, potency and half-life, is clearly a worthwhile subject of study for these purposes. What Do Lab Studies Say About Pterostilbene and Prostate Cancer? To test the effectiveness of pterostilbene at restoring PTEN through MTA1 downregulation, researchers took two groups of rats and fed one group pterostilbene for eight to 10 months (2). Both groups of rats had a precancerous condition at that point, but the group fed pterostilbene had higher expression of PTEN and only about half as much tumor involvement. By giving daily pterostilbene injections to the other group, the researchers stopped the progression of their cancer and decreased the appearance of new tumors by 88 percent. Finally, the researchers found that pterostilbene accumulated in the prostates of both groups but that injections produced greater accumulation (as one may expect). The dosage used in that study was 100 mg/kg in the diet. Using the FDA guidelines (3) to translate into Human Equivalent Dose (HED), we get around 8mg/kg or around 560mg for a person of 70-kg body weight. This dosage can probably be reviewed lower but further studies are needed. Another group of researchers previously looked into whether pterostilbene had anti-cancer effects similar to those of resveratrol (1). Upon comparing the two substances, the researchers determined that both were effective against all stages of prostate cancer but that pterostilbene was markedly more effective across the board. In conclusion, the researchers stated that their findings confirmed the importance of MTA1 to prostate cancer development and noted that pterostilbene represents a natural treatment that is both potent and safe. In conclusion, pterostilbene in dosages already available in supplement form, appears to offer an effective natural alternative to conventional treatments for prostate cancer and to keep it healthy. The anti-cancer effects of resveratrol, a formerly promising but ultimately disappointing substance, are now confirmed to also be present in pterostilbene, a more powerful form of this impressive polyphenol. As research continues into pterostilbene, still more positive effects against prostate cancer and other conditions may emerge for the benefit of patients everywhere. (1) PLoS One. 2013;8(3):e57542. doi: 10.1371/journal.pone.0057542. Pterostilbene acts through metastasis-associated protein 1 to inhibit tumor growth, progression and metastasis in prostate cancer. (2) Oncotarget. 2016 Mar 1. doi: 10.18632/oncotarget.7841. Dietary pterostilbene is a novel MTA1-targeted chemopreventive and therapeutic agent in prostate cancer.